Joint workshop of the German Institute for Japanese Studies (DIJ), Tokyo, L’École des Hautes Études en Sciences Sociales (EHESS), Paris and Japanese-German Center Berlin (JDZB). For decades, many policymakers and international organisations such as OECD and the IMF, have emphasised the need of structural, especially labour market reforms to improve competitiveness. While many arguments of this debate are still present today (e.g. in the 2017 French election campaign), it is now widely accepted that growing social inequalities have contributed to an increase in income inequality and that rising inequalities in the labour market could be a major factor behind feelings of political marginalisation and alienation, vote abstention, support for extremist and/or anti-establishment parties and growing distrust in parties and democratic institutions. However, the political consequences of growing inequalities may be less clear than is often assumed. While France, Germany and Japan share many similarities with regard to their dualistic labour market structures with a strong divide between workers in good and those in insecure jobs, they are displaying different levels of support for extremist and populist parties. Japan has currently even no populist movement to speak of, yet voter turnout has fallen to historically low levels and, according to surveys, young Japanese seem increasingly indifferent to the benefits of a democratic system. 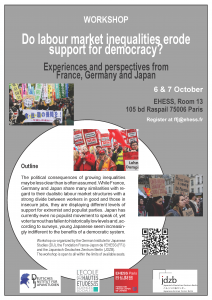 This workshop seeks to investigate links between labour market inequalities and falling support for and trust in democracy by bringing together scholars and experts from France, Germany and Japan. The aim of the workshop is two-fold: First, it seeks to establish how labour market inequalities impact politics, political participation and support of democracy in each country. Second, it addresses how different policy and regulatory regimes may contribute to alleviating socioeconomic divides and to enabling strategies to counter political marginalisation, anti-mainstream sentiment and mistrust in democracy overall. Panel 2: Labour market inequalities and falling support for democracy: How strong is the link? Which factors explain inter-country differences? Panel 3: Can labour market policy and regulation restore trust in democracy?